Keep Your Valuables Safe And Close – Use Your Loft For Storage! At Yorkshire loft ladders we supply and fit every conceivable type of loft ladder and attic ladders for domestic and commercial customers throughout Yorkshire. 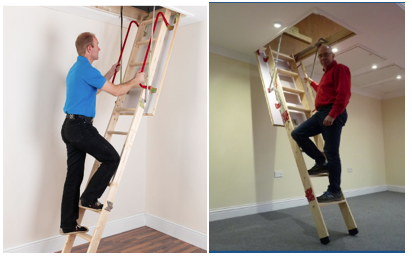 We only use the highest quality of loft ladders and our range of loft ladders and attic ladders provide a convenient and safe way of accessing your loft or attic, enabling you to make full use of the extra space your loft or attic provides. Whether you require a deluxe wooden loft ladders,telescopic loft ladders, aluminium loft ladders or commercial loft ladders.Yorkshire loft ladders are your one stop shop for all your loft ladder needs. Our team of experienced and highly skilled loft ladder fitters and installers aim to delight each and every customer with their quality of workmanship and our highly competitive loft ladder prices. Safety is also important when using your ladder as you will be up to 3 meters off the ground. 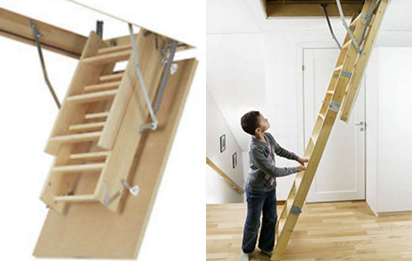 A loft ladder takes you straight into the loft without you having to climb into it offering a safer option. The ladder is also very sturdy and can take a large amount of weight without swaying. A loft ladder is always fixed to the loft hatch meaning the ladder won’t move which is a risk you take with a step ladder.We make sure all our customers are given safety instructions to show them how to use their ladder.